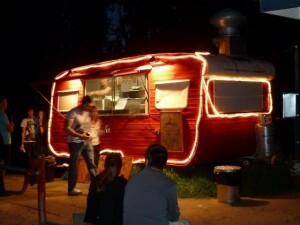 Canberra does not have a history of food carts. The nearest would be a double decker bus that opens at night time at the top of Braddon. Another would have been the now closed Brodburgers that was a very popular red caravan packed on the side of the lake. That was its problem – it was parked on land overseen by the fairly useless National Capital Authority (NCA). The NCA eventually had it moved despite an overwhelming amount of support for it to stay. People would flock there day and night for their burgers. In the end the owners were traded a spot for a permanent cafe site in amongst the housing developments on Kingston Foreshore. While the solution was probably good for the owners and the NCA, it left the concept of food carts as being undesirable in Canberra. This is a shame. There’s a story just in of how the food carts in New York are changing and are becoming more responsible in their use of energy. Click here. The NCA should be also moved on given that it is no longer relevant or desirable. There’s more on the Brodburger story online – click on the image above.